Van security should not be taken lightly. 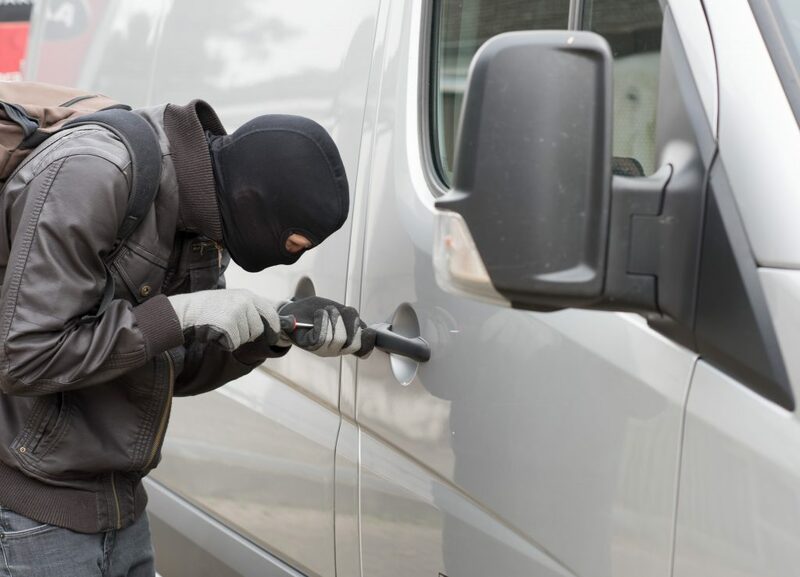 With an alarming amount of vans being targeted by thieves, it’s imperative that you ensure all security measures have been taken to protect your van and its contents. Research by the Federation of Master Builders (FMB) found that 51% of builders in the UK have had tools stolen from their van. FMB’s State of Trade Survey for Q2 2018. The loss is more than just damage to your van and tools, it impacts your business and potential earnings. As a small business owner, you can’t afford for your business to be interrupted. Whilst you may have adequate van insurance cover, the hassle that comes with getting everything back on track can be time-consuming and costly. We’ve put together a few van security measures you can take to help protect your business van and contents. Advertising your business details on your van has both pros and cons. You should feel comfortable being able to advertise your business on your van without worrying about the repercussions. In the unfortunate event that your van is stolen, it’s easily recognisable when branded with your business name and contact details. The downside is that you’re displaying to potential thieves what your business does and they could speculate as to what would be in your van. This could lead to your van becoming a target, so ensure you take additional security measures. Black-out any rear windows to keep valuables out of sight of prying eyes. Ensure that your windows are tinted by a professional to comply with the UK law. Ensure that you notify your van insurance company of any modifications made to your van outside of the manufacturers specification. Don’t leave anything in your van unnecessarily. Remove valuable contents and store them securely somewhere other than your van. You can also add signs to your van to state that nothing is kept in your vehicle overnight. Deadlocks are mechanical devices that are fitted to the door(s) of your van. These are fitted outside of the manufacturers standard locking mechanisms. They work by throwing a bolt into a receiver that’s been fitted to the opposing body section. Deadlocks are operated manually by the user via an external key. Whilst deadlocks prove effective, they are dependant upon the user. In contrast a slamlock device is ideal for van users who are in an out of their van quite often, such as a delivery driver or courier. Slamlocks automatically lock the vehicle door when shut. These offer greater security than a deadlock, as there is no human intervention required. A catalytic converter lock is a device designed for commercial and heavy-duty vehicles. Catalytic converters and exhaust system components are extremely valuable and are therefore an ideal target for thieves. To prevent theft, a catalytic converter lock can be installed around the catalytic converter or diesel particulate filter (DPF) to prevent theft or tampering. Van boxes and vaults offer a secure storage space for your tools and equipment. Suitable both in your van and on site, these robust heavy-duty steel storage boxes are generally fully welded making them virtually impregnable to all but the most sophisticated thief. If you don’t need to remove your box from the van, consider having it bolted in! Van security cameras are becoming ever popular due to the invaluable footage they provide should your vehicle become involved in an accident or be targeted by thieves. There are a number of positions within your van that cameras can be positioned, each serving a different purpose depending on your needs. Whether you drive a small, medium, large van, bus or HGV lorry, consider having security cameras onboard to protect you and your equipment. Dash cam – perfect for recording a drivers view of the road and also allows you to see those who approach your van whilst its unoccupied. Rear camera – these double up as a reversing aid and security camera for people who approach your vehicle from behind. Cabin camera – mounted inside the cockpit of the cabin, these cameras can record driver behaviour and prove invaluable in providing evidence should your van be broken into. The majority of vans will have some form of alarm or immobiliser fitted by the manufacturer as standard. Ensure the alarm is at minimum a Thatcham category 2 approved one, this means that it must have an immobiliser included. If your van doesn’t have an alarm, consider installing a security alarm system in your van to reduce the risk of damage and theft. You can’t afford for your business tools or mode of transport to be stolen, the potential loss of both income and equipment can be quite scary. There are a large number of van security alarms on the market, from basic alarms to more sophisticated ones that will inform you direct to your mobile within seconds. Security cages and enclosures can be used in their own right, however, for the ultimate protection having a security cage installed inside your van adds a further layer of protection. These heavy-duty cages are typically made bespoke to your vans requirements. Install a GPS tracker for your van and you’ll always know it’s whereabouts. GPS trackers are not as costly as you may initially think, however, they generally reduce handyman van insurance premiums! With a GPS tracker installed, you’ll be able to locate your van from anywhere at anytime of the day. Above all, don’t leave the security of your van and it’s contents to chance, invest in making sure you’ve done everything possible to protect it.